You remember PETA, the people who would rather kill dogs and cats than find them homes? Yep, aren't they just too precious. We've blogged about them here on many occasions. Check out www.petakillsanimals.com for some eye-popping truth about the underlying evil nature of PETA. In 2007, PETA employee Jane Garrison, her buddy Judie Mancuso and their husbands formed an animal rights group in California. They called it “Social Compassion in Legislation”. The goal? Agitate for spay and neuter laws in the state of California. The method? A relentless political campaign for spay-neuter legislation, enabled by well-planned propaganda to promote public acceptance. The left wing slant in the state of California has gotten so out of control that we actually had Judie Mancuso, a PETA supporter and founder of “Social Compassion”, recently appointed to the California Veterinary Medical Board! Fresh from her crusades sponsoring failed bills that would have required all pets in the state of California be sterilized, Mancuso continues to push her anti-pet breeding agenda from a position of authority as a member of the CVMB. “Social Compassion” was behind two recent onerous pieces of proposed legislation; AB 1634 and SB 250. The former would have required all pets in the state to be sterilized, with a few narrow exemptions. The latter would have required mandatory sterilization and would have also prohibited the sales of unaltered dogs and cats. Several other animal rights groups also joined Social Compassion in official support of these bills. So far, our state legislature has rejected this proposed intrusion into pet owners' rights to choose their pet's reproductive status. However, with a newly-elected Democratic supermajority in both the California Senate and Assembly, the next legislative push for spay-neuter laws will likely be successful. Meantime, as the animal rights groups strategize their next move, the focus has temporarily shifted to spreading propaganda. And what better way to spread propaganda than on the back ends of thousands of cars? 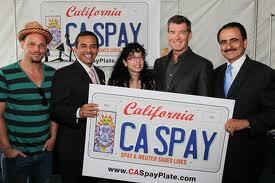 Almost two years ago, "Social Compassion" began a push to mass produce a California spay-neuter license plate. With "Social Compassion" founder Mancuso sitting on the California Veterinary Medical Board, it was easy to solicit CVMB support for this license plate program. A minimum threshold of 7500 orders is required to begin production of special license plates; that's the break-even on the expenses of printing up special license plates. Yet today, many months later, the animal rights groups can't quite manage to sell the minimum amount of spay-neuter license plates. They desperately pushed a bill attempting to get themselves a special exemption to reduce the numbers of pre-orders down to 2500 to get their “pet project” rolling. When that effort failed, they introduced another bill, AB 610, that passed and successfully extended their pre-order deadline for another year, until June 2013. Why there's some of the perps now!! Now mind you, our state has nearly 40 million residents, yet the spay-neuter fanatics can't seem to find more than about 6,300 people gullible enough to pre-order this special license plate. That's only 0.016% of the population, or less than 1 in 6200 people. Understandable, because not only is this plate UGLY, but this license plate promotes the urban legend that sterilization is healthy and beneficial. Seems that “Social Compassion”, PETA and the HSUS are devoting a great deal of time and effort to promoting these license plates. But don't be fooled; propaganda is the top priority; they don't care about actually funding any pet clinics; nor finding homes for shelter animals; nor setting up programs and policies that help people keep pets in their homes. The priority is to push lies about “overpopulation”and the presumed need for widespread pet sterilization. This week, “Social Compassion” sent out an email blast with a special offer. Pierce Brosnan, the Hollywood actor/artist who designed the license plate, is offering to PAY for a free license plate for anyone who wants one. He is being joined in this offer by Katherine Heigl, another Hollywood celebrity nutjob. Heigl recently set up a website in support of animal neutering proclaiming “I hate balls”. (www.ihateballs.com) This website demonstrates how misguided, sick, twisted and desperate these animal rights nuts are. Uh, OK. Where do we begin to address what is “wrong” here? First off, if Brosnan and Heigl were really interested in spay and neuter as a presumed cure for the imaginary problem of pet overpopulation, their money would be much better spent in directly providing for free spay and neuter clinics. But no, their main interest is advocacy for the cause of animal rights; the elimination of pet breeding and strictly limiting pet ownership. Brosnan is also seeking the ego boost of seeing his great art masterpiece plastered about the state. Secondly, there is no guarantee that any funds beyond the cost of production will go to any spay-neuter program. ZIP. ZILCH. NADA. IF there are profits from the license plate program, the sponsoring agencies collect the money in a License Plate Fund. Per the text of the agreement “ the sponsoring agency shall expend all funds received under this section exclusively for projects and programs that promote the agency's official policy, mission, or work.” And, "to allow the Veterinary Medical Board to support the critically important efforts of city and county animal shelters to address serious animal care and control problems facing the state." You may have noticed that the words “spay-neuter program” are nowhere to be found. Imagine that! The VMB may collect the profits and use them as they see fit. Why, they could even decide to funnel that money to [wink wink] Mancuso's “Social Compassion” group. Funny thing about "Social Compassion" is that those who work for them are unpaid “volunteers”. Volunteers who have endless resources and time to travel thousands of miles back and forth across the state of California, to produce multiple propaganda websites, to lobby incessantly in Sacramento and at the local levels. Mancuso owns a lovely house near the ocean in Laguna Beach. How does she pay her mortgage? How does she support her lobbying lifestyle? Perhaps now that she is on the CVMB, Mancuso does actually receive some sort of salary, but where has her support come from in the past? It can only be from animal rights groups such as HSUS and PETA. They are paying her for her tireless work toward the extinction of pet ownership and breeding. It is disgusting that an unscrupulous lobbyist like Mancuso has wormed her way into an influential position in state government. It's galling and appalling that this woman, a vegan animal rights fanatic, has weaseled her way onto the California Veterinary Medical Board. The admitted goal of animal rights groups behind these initiatives is NO BREEDING. They prefer to force us to import mutts from other countries, especially from nearby Mexico, but also from as far away as Taiwan, the Caribbean and Europe. These dogs are often street dogs who bring with them other special bonuses like parvo and rabies. So you can forget about finding an intentionally-bred healthy puppy, a purebred dog, or a “designer” dog bred on purpose, if the animal rights groups have their way. Breeding laws here in the US are now so restrictive that it is difficult to find a puppy of any sort....purebred or street-bred. And in an animal shelter? No puppies. When they occasionally enter they are stolen by staff, snapped up by “rescues” and sometimes even raffled to the highest bidder. Despite being touted by animal rights groups as being “healthy”, sterilization surgery, especially when performed while the dog or cat is immature, is ironically responsible for many health problems..... everything from spay incontinence, to a depressed immune system, hypothyroidism, and orthopedic disorders as a result of abnormal bone development. This is just the tip of the iceberg; we have detailed many of those problems here in the past, check our tags “spay/neuter” and "rethinking spay neuter". These license plate proclaim "Spay-Neuter Saves Lives"? There is absolutely NO data to support such a ridiculous claim. Spay-neuter is certainly not a "PRO LIFE" agenda. It is ANTI BIRTH. And it is certainly not "PRO CHOICE." The extremists want to take the CHOICE of spay-neuter away from the person who owns the animal. Considering the adverse health effects of spay-neuter, we should use the existing excellent tools readily available for doggie birth control. They are called DOORS and LEASHES. These amazing tools are very reasonably priced. Even low-income individuals have access to them. As an added benefit, these great tools are highly effective in preventing death from a car or a coyote. They also work perfectly to prevent your dog from chasing the neighbor's cat or using the neighbor's lawn for a toilet. Where is the license plate educating about the need to confine your pet? I sincerely doubt that Judie Mancuso, Pierce Brosnan, Katherine Heigl or anyone at PETA or HSUS give a flying fig about your dog being hit by a car. And then there is the obvious disingenous nature of this offer. If these celebrities and PETA people really do want to subsidize spay and neuter clinics, why don't they just open some up themselves? Or donate directly to those already in existence? We all know the real agenda here. Propaganda regarding spay and neuter is the priority. Control the public psyche and you win the debate. The public must fervently and earnestly believe in “pet overpopulation” in order for the animal rights groups to pass more laws regulating pet ownership and breeding rights. If state-sponsored license plates urge us to support spay-neuter, it reinforces the public perception that more laws are necessary to address a “problem”. And if you believe in the notion of supposed “overpopulation”, then do I have a bridge to sell you. Check our posts on this blog for articles that blast the notion of “pet overpopulation” right out of the water. Dog breeding is illegal in most states and most localities. For that matter, so is owning a kennel. Or even owning a dog, in most places. What? Don't be ridiculous! I'm a licensed breeder! I have a kennel license! My dog is licensed!! Do you understand what a "license" IS? A license is special permission from the government to perform an act or conduct an activity that is otherwise illegal. So the truth is -- dog breeding is illegal, having a kennel is illegal, and even owning a single dog is illegal. Some people get special permission to perform this otherwise-illegal act. But the cost of the permission (license) is often prohibitive, if not for itself, then for the mechanical requirements (what you have to build) and/or the conditional use permits (another form of government permission to do something with your own property, that would otherwise be illegal... such as own a kennel). According to municipal estimates, 75% or more of all dogs are unlicensed. And I'd hazard that 90% of all hobby breeders are keeping and breeding dogs illegally -- at the very least, in excess of their license (which is to say, their limited grant of immunity from prosecution). Which means -- breeding or even possessing any of those dogs is illegal. Next time you complain about all those terrible unlicensed kennels, think about who that really is, and that what you're really asking for is that ALL dog breeding and ownership be declared illegal -- except for those special individuals granted a license by the government. And when you declare that "most of those breeders shouldn't be licensed anyway" ... consider that as the regulatory noose continues to tighten, someday you too might not be considered good enough to get that special permission to breed and own dogs.